There’s a lot of assumptions, opinions and expectations when it’s the husband who was betrayed. Many assume a betrayed husband experiences the same challenges, and feelings, a betrayed wife faces. To some degree they do. Either way, it’s a trauma. But there’s also many differences for betrayed husbands, and many people don’t understand that. That’s what I want to break down for you today. another church member or someone the husband and family knows fairly well? So the betrayal is even worse when another guy ‘breaks the code’ of not stealing another mans wife. (which I know many betrayed wives can relate to as well). is because men and women react to this level of personal trauma of betrayal differently. Not too many women will feel it’s affected her “womanhood” the way a betrayed husband often feels his “manhood” was severely hit. Even the healing process is different for men. but the differences are there and often misunderstood, that’s why I’m bringing it up. 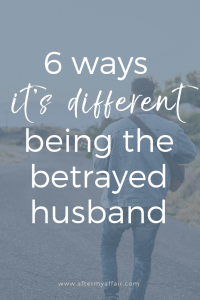 5 ways it’s different being a betrayed husband. in response to their wife’s affair, is often very different. First of all, most men are expected to ‘be strong’ and ‘push through’ any of their feelings without really talking about them much. when the wife is unfaithful), will often give advice that tends to actually make things worse. 1. Work harder to show her your love and affection; do whatever it takes to win her back. the marriage dynamics have greatly shifted when the wife is in an affair. Plunking some flowers on the table, and doing more around the house, aren’t going to fix their infidelity issue. he soon becomes more frustrated to see his efforts are not softening her. I’ve seen men who basically become doormats for their wayward wife to do what she wants. This only causes a man to lose his self-respect, thinking that if he makes great efforts to win her back, she’ll see the light. causing a wife to recoil further away. she’ll often see that as desperation which only pushes her further away. Because infidelity is not as easily fixed, like just having an argument, so those usually methods won’t work. Besides, desperation doesn’t look good on anyone, my friends. The 2nd piece of advice many people may give a betrayed husband is the tough love advice. or we likely wouldn’t have the outcome we have now. You can read more of our marriage story here. Nobody should tell you what you need to do in your marriage. Unless they’ve experienced this themselves especially, they have no clue how they would really react if this happened to them. (Even though many people think they know beforehand). Nobody can tell you what is the right thing for you to do, but you. Rash decisions now, often result in major regrets later. always wondering if they gave up too quick. not your friends, family, counselor or pastor. of why she’s having this affair- convincing herself even more that her husband is so awful, and her affair partner is so wonderful. So, this only creates more rejection and trauma for a husband. 2. From a man’s point of view, his wife’s affair directly affects his manhood. “Feeling emasculated, impotent, less of a man” or he feels he’s “lost his identity as a man”. is on a different level than many betrayed wives feel. Not worse, but for a man, it does create feelings of affecting ‘his masculinity’. even if she ends the affair and returns home. That’s why he has to face these feelings and work through them, not try to “man up” by burying them. So those are issues he really needs to deal with. But that’s really not true, and it’s really damaging for a betrayed husband to believe. just know that her affair was more about her, than it was about you. Something within her was lacking, and she chose to look elsewhere for validation and connection rather than to you, her husband, and to the marriage. Men frequently go to the place of ‘sexual comparisons’. Expanding on how his wife’s affair affects his manhood, men often quickly go to sexual comparisons with her AP. Although betrayed wives do this too, they often compare their looks more than a betrayed husband does. When a man has been betrayed, often his first thoughts are “what does he have that I don’t have? The most important fact for a betrayed husband to understand; it wasn’t about what he didn’t have, that her affair partner has. Because there’s a reality about the affair partners a wife often has an affair with…they affair down. in so many ways, that it’s mind boggling why she chose him at all. and it’s not entirely clear why a wife would do this. guarantees someone will truly want her, and give her the attention she craves. this allows her to be someone else, by being with someone else she wouldn’t have otherwise chosen. (Understand, much of this isn’t even on a conscious level at first). The Limerence stage of affairs can create quite an affair fog. I know this is true from the women I talk to, and I also definitely experienced it myself. Many women will even tell me that they know they wouldn’t have chosen to be with a man if she were single etc..
(in the Limerence stage) and they’re even later confused as to why they chose him. to recognize it wasn’t because the other guy was better than you, as it’s often the opposite. at just the right time, and validating her emotional need for attention and maybe her need to know ‘she still has it’. You can read more about affair fog and what it is not here. Plus, what is affair fog and 5 signs to watch for. 3. Men compartmentalize their feelings more. I know this seems like a broad generalization, and some men are the exception to the rule. But the majority of men shut down emotionally when something like a betrayal happens to them. It’s the message men are given from the time they’re little boys- to be a man you don’t cry or show your feelings. So what’s a betrayed husband supposed to do when he’s just been hit with the deepest pain any man can experience? They find ways to compartmentalize the pain and wall it off from the rest of their lives to just try to function. a counselor or take anti-depressents and he often experiences a fight or flight reaction to his trauma of betrayal. likely want to do both, often within minutes of each other! It’s normal. Many men feel like they’re really weak if they stay in the marriage, like a ‘real man’ wouldn’t put up with it. and work on the marriage, sorting through the process of grief and forgiveness, instead of divorcing her quickly. one can take. The time for that is different for everyone and only you can answer for yourself). Betrayed husbands often feel frustrated when their typical way of solving problems doesn’t work in this situation. Many men, when faced with a problem, usually try to conquer that problem by figuring out ways to fix it. instead of just sitting and listening to her? (no fault of your own, guys, it’s a good quality that needs to be channeled right). But of course, a wife’s infidelity doesn’t work that way. There’s no quick fix solution, and it cuts a guy to his core, that she chose another guy over him. pretty much out of his control. is often much different than a unfaithful husband’s reasons. Because of this difference, the response from a betrayed husband must be different, too. Women often have affairs for the feelings of emotional connection with their affair partner. They seek out that feeling of being special, desirable and unique. ‘feeling attractive and wanted’ is often at the core. in an even greater way than a unfaithful male would do. I did that too, you can read a piece of my story here. It’s hard to be emotionally available and connected to two people, right? So all her attention soon shifts to the affair partner, to fulfill her needs. The difficult part for many betrayed husbands is the dramatic shift in his wife’s behavior, when she’s in an affair. The kind and caring woman he thought he married, is now hostile, cold and aloof from him, and there’s no quick fix for him to change her. by changing the story and history of their entire marriage. This is actually quite common in both unfaithful women and men. they know what they’re doing goes against that. (an inner conflict when one has 2 conflicting beliefs or behaviors at the same time). and minimizing the good that was there. are often magnified far beyond what they were. I’d have when continuing on and off in the affair. So I can see why unfaithful’s do this. Rewriting history is a common tactic to dull the guilt, and justify to themselves, why they’re doing this. against the kindness and love from their husbands. We touched on this in #1 because it’s often the advice people give to a man whose wife is cheating. What may have worked in other situations, can actually make her angry now. Not because what the betrayed husband is doing is wrong, but because it’s right. That may be hard to understand and even counter intuitive, so I’ll explain it. she usually feels a combination of conviction, mixed with some resentment. and the conviction she feels about her acting out behavior, that is why she pushes him away further. This can lead many men to feeling hopeless in not knowing what they’re supposed to do. Yet, this doesn’t mean you should also be cold and withdrawn from her. Finding a balance between overtly pushing her to re-engage, and being aloof toward her too, is important. when you find out about your wife’s affair. Also, about the delicate balance he needs to navigate and how. This video where I interviewed my husband Jim. You’ll hear his perspective about my infidelity, and mistakes he even made. How to cope when your wife is having an affair. Also check out this collection of betrayed husband posts.